We are excited to introduce you all to one of our newest and tastiest vendors here at Tip’n the Mitten, Messy Dave’s! Just add ground beef and serve! Best of all, the convenient resealable package means that you don’t have to cook the entire pound at once. 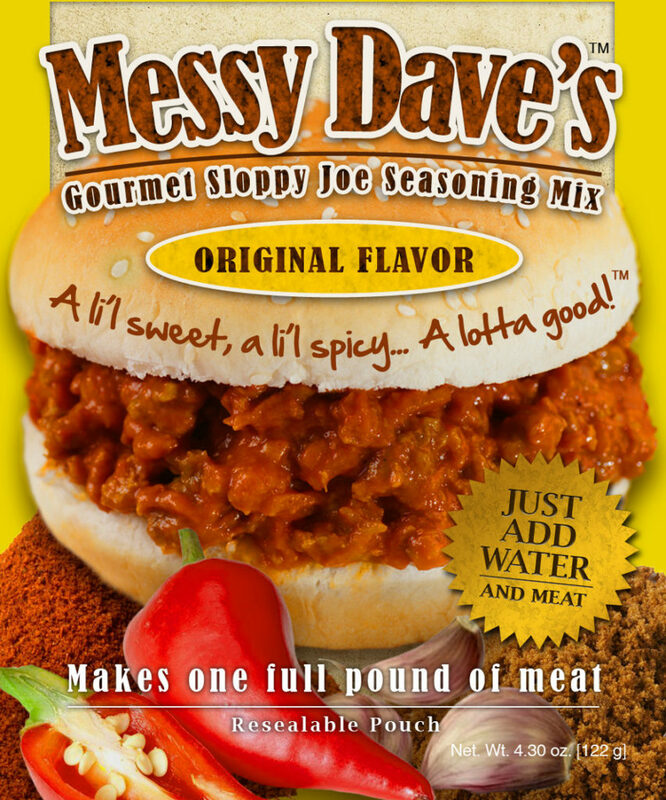 Messy Dave’s is a gourmet, Michigan-made sloppy joe mix, great for any meal! Just add ground beef and serve! Best of all, the convenient resealable package means that you don’t have to cook the entire pound at once. We were excited to meet the owners/creators of Messy Dave’s just last week when they stopped in to drop us off our first shipment of this fun new addition! A wonderful and fun couple, they introduced themselves to us as “messy dave and messy Dave’s wife” 😉 we chatted and spent some time getting to know each other and were excited to see how well we think these great folks fit into Tip’n the Mitten and make us even better. Both of our flavors are based on a family recipe going back 40+ years. We started our business in January of 2013 in just two Metro Detroit area specialty grocery stores and as of April, 2014 Messy Dave’s is now sold in thirty nine such stores throughout the lower peninsula of Michigan. We utilized the MSU Product Center’s assistance to teach us the ‘How To’ start up a food related business. While we talked, we got to hear a bit more about the story including how the recipe itself stems from wonderful childhood memories of “grandma’s recipe”, adapted and made into something they were able to share with others. Welcome Messy Dave’s, we are glad to have you!